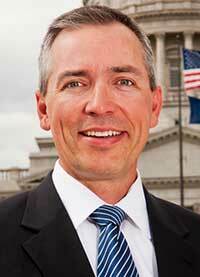 Rep. LaVar Christensen, R-Draper, will not be on Utah’s Capitol Hill as an elected official come January. According to a Facebook post by Rep. Ken Ivory, Rep. Dan McCay, R-Riverton, received 63 percent of the votes in his bid for the Utah Senate District 11 seat on the first ballot at the 2018 Utah Republican Party State Nominating Convention at the Maverik Center Saturday. The threshold needed to avoid an in-party primary is 60 percent. Christiensen, McCay, and educator Delania Tonks ran for the GOP nomination to replace retiring Sen. Howard Stephenson in Senate District 11. McCay will now face Democrat Christian Burridge in the general election in November. Christensen gave up his House seat to run for the Senate, is finished in the Legislature for now. Utah Policy’s Bryan Schott reports that McCay seemed shocked he was able to win the nomination so quickly. “You never know how hard work is going to be reflected in the vote,” McCay told Schott. McCay also told Schott that the dual-path method of choosing party candidates for races is working. Christensen won his House seat two years ago by only five votes. He was the author of Utah’s Amendment 3, which defined marriage as between one man and one woman, as well as several other anti-LGBT measures over the years. The people have spoken. Good riddance to you Lavar. It’s also good to hear Ken Ivory will be able to protect his commercial interests. Whew, that was close. I think he took the chance on running for Senate because he didn’t think he could hold his House seat. Two years ago he was re-elected by FIVE votes. glad to see him go. I rather think he is anti-everything. Careful—McKay is actually far more dangerous. Lavar may have the hate of the LGBT community over amendment 3 but he ended up being an impotent legislator. I’d take him over McKay. It is funny-my first read of the tagline I saw that he had been “outted” instead of “ousted”-and I thought “Of course he’s gay”.